In 2011 and 2012, I was awarded with one La Caixa Journalism traineeship, granted to only fifteen Spanish young journalists every year, to work for a two-year period for the international news agency Efe, the main one in Spanish and the fourth largest in the world. 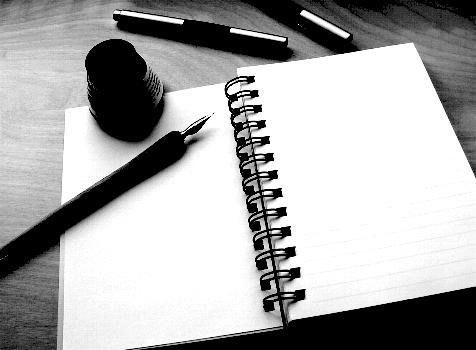 In my case, I spent the first year assigned to the Society and Future department, in Efe's headquarters in Madrid, where I drafted stories and features on various topics of social concern, such as health, science, education, immigration, demonstrations, religion and communication. Some of the most interesting coverages during this period were the protests of the 15-M movement -also called 'indignados'-, and the visit of Pope Benedict XVI to Madrid. In January 2012, I was transferred to Efe's London bureau office, where I continued writing but I also produced videos, stand-up stories and radio news. Many of these coverages were multimedia, which means that the reporter has to elaborate the same piece of information for all kind of fomarts. Some examples of this were the coverage of the Edinburgh Festival and the London 2012 Festival, also known as the Cultural Olympiad held simultaneously with the Olympics. London, the capital of European science, generates a large volume of information about science, technology and health, to which I devoted special attention. 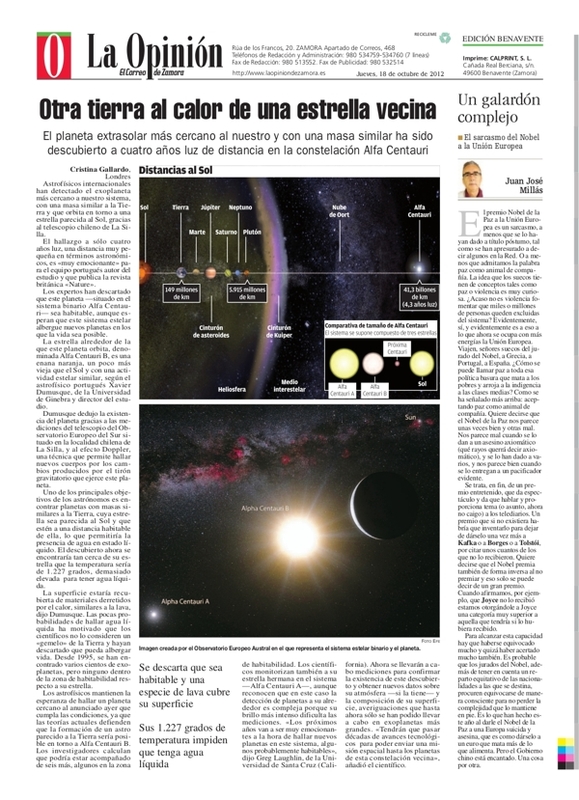 "Otra tierra al calor de una estrella vecina" (Another Earth-like planet under the heat of a close star), El Correo de Zamora, 18 October. Story about the finding of the nearest extrasolar planet, found at 4 light-years away in the constellation Alpha Centauri. The article was published in the back of the print edition and on the newspaper's website. This item, originally published in the scientific journal "Nature" also got coverage by the Spanish daily "ABC", "El Economista" and "El Heraldo de Aragon" and the Uruguayan "El Observador", among others. 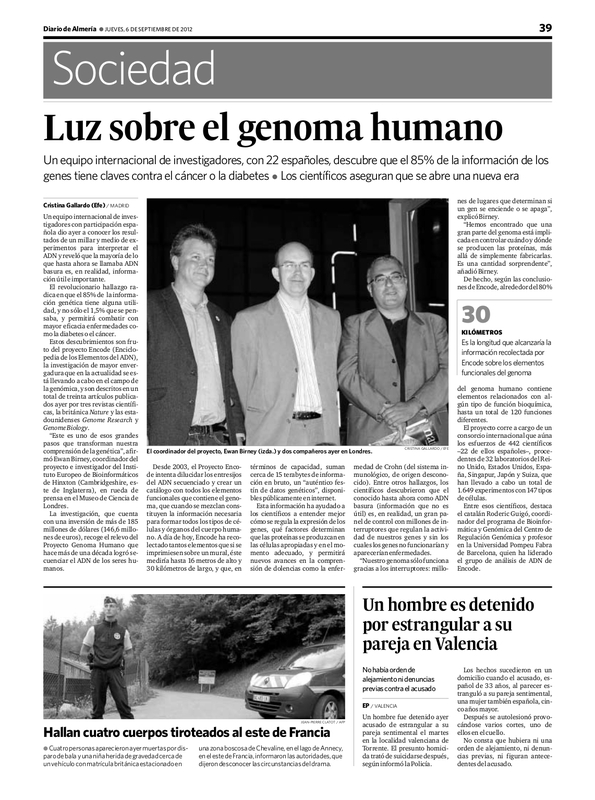 "Luz sobre el genoma humano" (Light on the human genome), El Diario de Almería, 6 September 2012. Story and pictures about the findings of the ENCODE project, thanks to which a large international consortium revealed that the considered junk DNA has a very important role in the evolution and development of diseases in humans. The newspaper opens its Society section with this article, which also appeared with different headlines in RTVE's website, and in the Spanish regional newspapers "ABC", "La Voz de Galicia", "Deia", "Faro de Vigo" o "El Día". 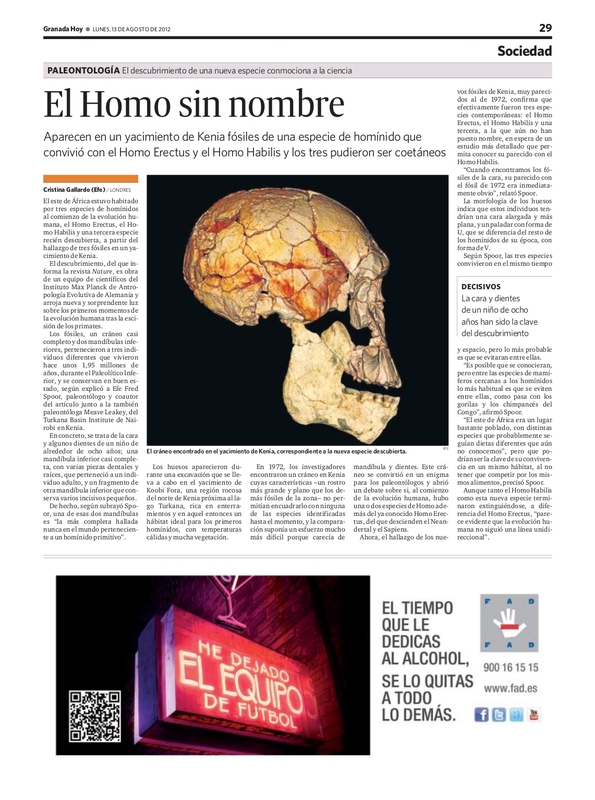 "El Homo sin nombre" (The Homo without name), Granada Hoy, 13 August 2012. Story about the finding in Kenya of some fossils that belonged to a third hominid species, which would have coexisted with Homo erectus and Homo habilis, 1,95 million years ago, in the lower Palaeolithic. Other media published this item, with different headlines, like the Spanish radio station Cadena Ser, and the regional newspapers "La Voz de Galicia", "El Heraldo de Aragón" and "El Diario de León". 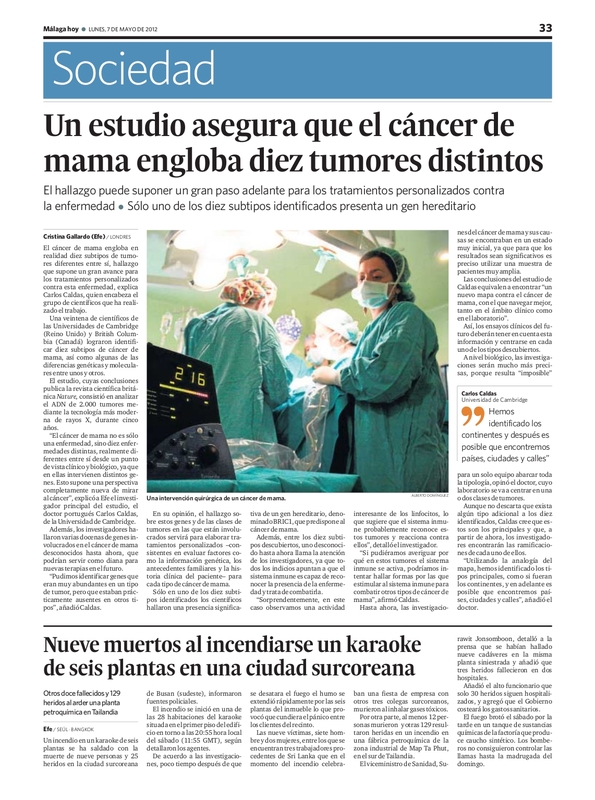 "Un estudio asegura que el cáncer de mama engloba diez tumores distintos" (Breast cancer includes ten different types of tumores, a study shows), Málaga Hoy, 7 May 2012. The newspaper open its Society section with this story about a recent study that divides the breast tumours into ten different categories, and forecasts important advances for the tailored medicine against the disease. The story was also published by the Argentinian newspaper "La Nación", the Mexican "Crónica" y "Vanguardia", the Spanish digital paper "El Confidencial", and the Spanish regional newspaper "El Día". "Self-funded communities: the last resource to meet urgent expenses"
"Sahrawi camped in Sol call for a referendum to end the conflict"
"The Edinburgh Festival brings the oral tradition back to the scene"
"The Edinburgh Festival kicks off inspired by the Olympic Games"
"Bagpipes and drums echoed in the castle of Edinburgh during its Festival"
"Tents illuminate the British coast to celebrate the Olympics"
"The Tate Liveerpool compares late works by Turner, Monet and Twombly"
"The British Museum devotes a large exhibition to Spanish drawings"
"'The Artist', big favourite for a Bafta to which Almodóvar is nominated"
"Three waves of migrants from Asia populated America for the first time"
"An exhibition in London explores the challenge of relieving chronic pain"